North Petherton Carnival was first reported as being held in the 1880’s. The first Carnival Committee was formed in 1886, but Carnival festivities had virtually ceased by the turn of the century. In 1948 local resident Mr Bunny Wheatley formed the North Petherton Carnival Club which decided to concentrate on the revival of the Carnival and in December of that year “North Petherton Guy Fawkes Carnival” was formed. The first Carnival on 5th November 1949 was a stupendous success with the crowd of 10,000 and 72 entries in the procession. Prize money totalled £150 and the street collection was around £19. In 1951 the “Somerset County Guy Fawkes Carnival Association was set up with North Petherton being one of the founder members. 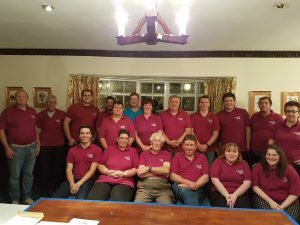 the association has been a guiding light over the years, encouraging co-operation between committees and presenting a series of trophies for excellence throughout the Somerset Guy Fawkes Carnival circuit. The Carnival has grown over the years and attracts entries from all over Somerset, Dorset, Devon and Wiltshire. Spectators come from as far afield as Wales, Cornwall, the Home Counties, the Midlands, Manchester and Yorkshire. Mesdame: Hayley Camm and Rosie Pincombe. Messrs: Bob Ringland, Andy Camm, P-J Wand and Steve Brice. Mesdames: Carrie Coggins, Sue Wand, Sharon Fox and Kirsty Fox. Messrs: Mark Halleron, Tony Ringland, Shaun Fox, James West and Gary Satterley. Messrs: Juan Clark and Geoff Clifford. Messrs: Keith Addison (Pentathlon), Georgina Brice (Westonzoyland) and Richard Coggins (Toppers). Our Marshals assist in event safety at Carnivals throughout Somerset during the various Carnival Circuits from September to November each year. When you see them please follow their requests as they are there to help you enjoy the event and to remain safe. We usually meet on the second Thursday of the month at 20:00 in the Walnut Tree Hotel, on Fore Street, North Petherton. 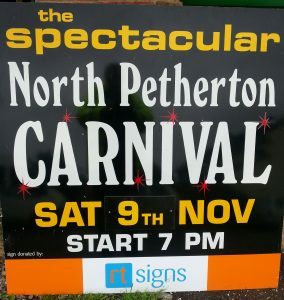 Why not come along and help us ensure the tradition of carnival in North Petherton. We are in need of assistance throughout the year, but especially during the weeks prior to the event as we prepare for the big day, help with servicing our trailers preparing our road signs. moving equipment and setting up on the day, catering for our marshals/judges/collectors, counters and helpers. If you can help us, by sparing a few hours of your time in any way please get in touch or come along to one of our Committee meetings.